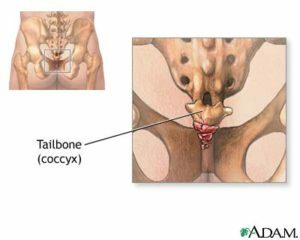 This week Mr. X presented to the clinic with tailbone pain. He has had low back pain on-and-off for years. This pain started suddenly and he’s unsure of what caused it. After doing an examination, it was found that his pelvis was twisted and very imbalanced. Due to his lack of spinal hygiene, tightness was found in his lower lumbar spine, sacroiliac joints, and sacrotuberous ligaments. After 2 visits of correcting these imbalances and improving the movement of his pelvis, Mr. X’s tailbone pain is almost gone! Unfortunately tailbone pain isn’t something that can easily be managed on your own. If you’re stuck in this situation, you can try to stretch out and massage the area, but it’s likely that you’ll have to get it assessed.